Children's literature provides powerful learning and entertainment opportunities that are catalysts to creativity and research. 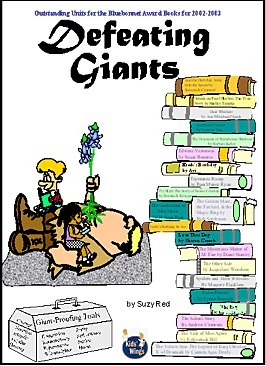 Defeating Giants, the 207-page activity guide for these books, is now available. See objectives it covers in the INDEX that includes activities in TAKS formats! Fly High! The Story of Bessie Coleman Borden. Louise and Mary Kay Kroeger. Love That Dog. Creech, Sharon. The Yellow Star: The Legend of King Christian X of Denmark. Deedy, Carmen Agra. Dear Whiskers. Nagda, Ann Whitehead. The Graduation of Jake Moon. Park, Barbara. Esperanza Rising. Ryan, Pam Munoz. The Golden Mare, the Firebird, and the Magic Ring Sanderson, Ruth. The Mysterious Matter of I. M. Fine. Stanley, Diane. And the Dish Ran Away with the Spoon. Stevens, Janet & Susan Stevens Crummel. Attack on Pearl Harbor: The True Story of the Day America Entered World War II. Tanaka, Shelley. The Other Side. Woodson, Jacqueline. The Graduation of Jake Moon is one of the literature guides in the Kids Wings' Defeating Giants collection that is built around a David and Goliath theme. You can order individual units from the collection for about $12.95 or you can order Defeating Giants, now on clearance sale, and receive this collection on CD and pay about $1 for each terrific literature guide in the collection!